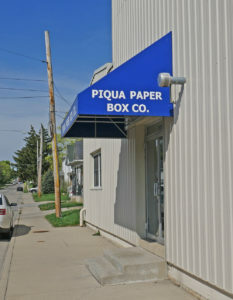 The Piqua Paper Box Company was founded in 1908. During these many years the company has successfully developed design and manufacturing techniques for rigid or set-up boxes. Complementing this is its experience in the broader field of packaging including all forms of packaging design and manufacturing. The company is well known and respected by its competitors as well as its customers. Quality and service have been the mainstays in the achievement of this respect. Located in west central Ohio, the company conveniently serves all of Ohio as well as all parts of the mid-western United States. Our products are frequently designed with the idea of enhancing your merchandise for the best possible appearance at “point of Purchase.” Often they are reused in their original form and nearly always are produced using recycled paper and board. We are one source which can give you custom-made packaging for many styles and materials. Our experienced staff is ready to advise you. You may wish to call or e-mail us at 937-773-0313, 1-800-536-2136, Fax 937-773-0412 or E-mail us. Either way we will be ready to assist you. We are committed to providing our customers with better quality, more options and the best pricing.